After a freak finger in car door accident involving my daughter on Tuesday that doesn't sound nearly as bad as it actually was (she literally could have almost answered nine to the question "how many fingers do you have? "), I just haven't been in much of a film mood for a couple nights there. The focus has been more on getting rest and just making it through with some normalcy as she dealt with the pain and a few nightmares that come from a young mind experiencing unrest after such trauma. Last night I felt the cinematic urges again, but it had to be a very specific type of film, a joyous work that my soul needed at the moment to give me a bounce in my step and a smile on my face. Singin' in the Rain was practically crafted for moments like this. When I was younger, I would have never given a film like this the time of day. Musicals? Lame. Dancing? Not interested. Younger version of me was a fool. It wasn't until I got a little older and my appreciation for cinema matured that I realized that the concept of writing off a genre as a whole without even giving a film a chance is absurd. There is no such thing as a bad genre, only bad films that occupy every single one. I assume there are plenty of musicals out there that would absolutely bore me to tears, erroneously reinforcing my belief that an entire faction of film would elude my tastes forever. 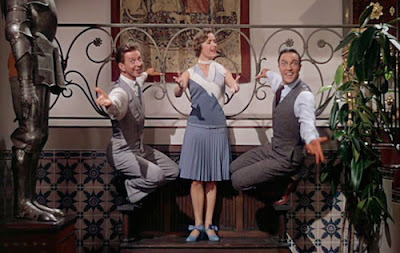 Singin' in the Rain isn't merely a wonderful genre film, it is one of the finest releases since the medium took shape. The songs are iconic. The performances are dazzling. The dialogue is sharp and clever throughout. The choreography is simply perfect. 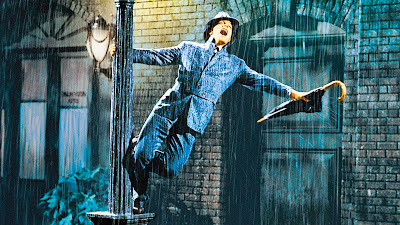 64 years after its release, Singin' in the Rain is still remarkably relevant and holds up in every possible way. Prior to my first viewing of this gem last year, I had incorrectly assumed that the picture would be an over the top extravaganza of song and dance when in reality this is anything but. When such aspects are utilized, they are done so with intelligence and class, knowing exactly how to also balance a wonderful story about the history of cinema and the challenges faced by a silent star when the dawn of the age of talkies arrived. Singin' in the Rain was, as expected, the perfect pill to cure some of my blues. If you still maintain some sort of resistance towards it because of the idea of a musical, just find a way to see it and allow yourself to experience true cinematic joy. It truly is one of the finest films ever made.